Bernard Crowe was called as a witness by the prosecution in the penalty phase of the TLB trial. The purpose was to show that Charles Manson was capable committing a violent act that could potentially result in the death of another. 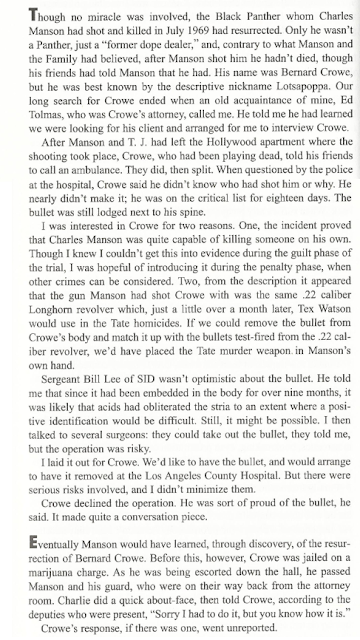 In fact Manson did believe that he had killed Crowe at the time he shot him. Vincent Bugliosi relates in his book Helter Skelter, Part 5 titled "Don't You Know Who You're Crucifying? March 1970" that it was by chance that Manson discovered that he had not actually killed Crowe when the two passed each other in a hallway at either the Hall of Justice or perhaps the LA County jail. Bugliosi says in the last paragraph that Crowe had been "jailed on a marijuana charge." 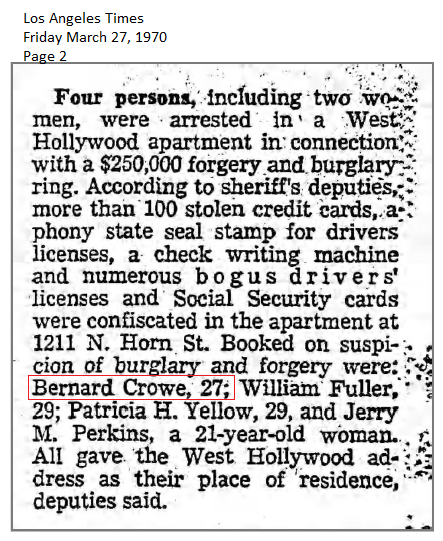 While doing further research into Crowe I discovered that he was not jailed for a marijuana charge but rather burglary and forgery charges. He was involved with three other people in what was said to be a "$250,000 forgery and burglary ring." To put it into perspective that amount of money in 1970 would be worth a whopping $1,555,109.54 today. Crowe's forgery endeavors were no small potatoes and much more lucrative that what Crowe could have made dealing kilos of marijuana. Cielodrive provided me with the trial transcripts of Crowe's testimony. I wanted to see what, if anything, was said about the burglary and forgery charges against Crowe or if they had any bearing on his testimony in the penalty phase of the trial. Bugliosi questioned Crowe first and nothing was said about the charges. When it came time for Irving Kanarak, Manson's attorney, to question Crowe it is apparent that Kanarak knew about the charges but due to his ham handed style of lawyering he was not able to present questions to Crowe about the incident in a manner that satisfied the court or prosecutor Bugliosi. 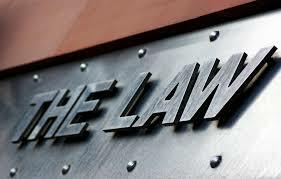 Kanarak broached the subject by asking Crowe if in May of 1970 or earlier that year if he had been charged with forging the seal of the State of California. Objections by Bugliosi ensued and counsel was asked to approach the bench so the matter could be discussed out of the jury's hearing. This line of questions and objections goes on for pages. What Kanarak seemed to be trying to get at was whether or not Crowe was going to be given leniency or perhaps dismissal of the charges pending against him for his testimony. Bugliosi objected at every turn. Crowe tried to invoke his fifth amendment rights a few times. The judge has him answer a time or two but in the end I think the jury is left with the impression Crowe was arrested for something, they know not what except that it might have involved the Great Seal of the State of California, and he may or may not be relieved of those charges for his testimony. The question for me was why, in his book, did Bugliosi misrepresent the charges that Crowe was facing when he had that chance meeting in the hallway with Manson? The book came out about three years after all was said and done. There had been testimony that Crowe was facing criminal charges though the jury never quite knew what those charges were. 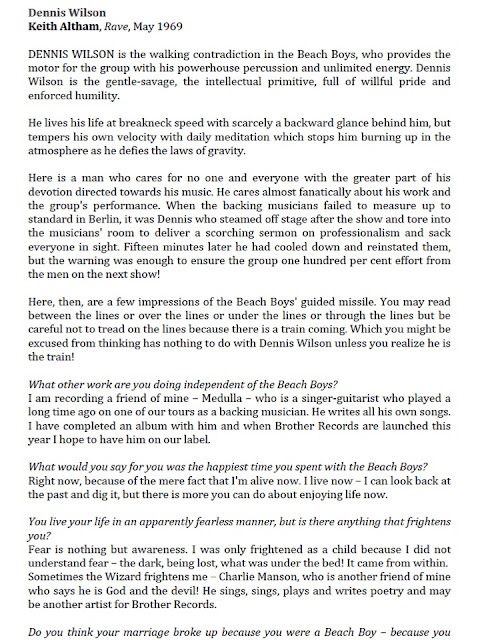 I drafted all of the above in this post before this post by Dreath was published. Comments made in that post had me rethink a couple of things. Col Scott said that Bryn/Bryan Lukashevsky was present at the Crowe shooting. 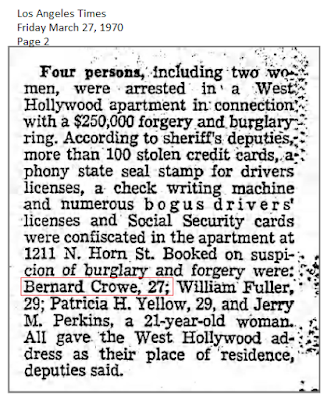 I could not find any evidence of that in the court testimony where Crowe named the people who were present. I looked for and found an LA Times article that recounted the day's testimony to see what was reported. I noticed that the person named Steve in the court transcripts of Crowe's testimony had quotes around his name in the newspaper article as if that was not his true name. The person named Del in the transcripts did not have quotes in the newspaper, neither did Rosina or Manson. However T.J. does have quotes around his name and we know T.J. was Thomas Walleman's nick name. I contacted Dreath to ask if it was possible the court would allow the use of an alternate name in testimony and he told me it was highly unlikely. It is done when minors are involved and if there was some legitimate reason to do so for an adult the name used would be "John Doe". Manson took "Steve's" shirt after shooting Crowe. I think if "Steve" were Bryn, Manson would have looked like he was wearing a dress if he wore the shirt. Manson was 5'2" and Lukashevsky was 6'1". Also, the reporter seems to think that the charges pending against Crowe were drug charges. The jury likely had that impression, too. There was no question that Manson shot Crowe, no one denied it, not even Charlie. The point of Crowe's testifying was to show that Manson was capable of violence that could result in murder. Why did Bugliosi write something that was definitely not true and in court suppress the true charges that Crowe was facing? When Did Dennis Wilson Finally Sever His Connection to the Family? Would it surprise you if it was in July, 1969? The experience, Dennis later estimated, cost him about $ 100,000. 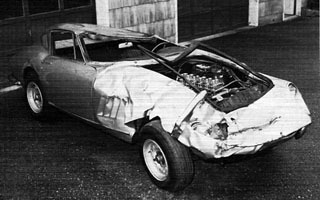 Besides Manson’s constantly hitting him for money, Clem demolished Wilson’s uninsured $ 21,000 Mercedes-Benz** by plowing it into a mountain on the approach to Spahn Ranch; the Family appropriated Wilson’s wardrobe, and just about everything else in sight; and several times Wilson found it necessary to take the whole Family to his Beverly Hills doctor for penicillin shots. “It was probably the largest gonorrhea bill in history,” Dennis admitted. Wilson even gave Manson nine or ten of the Beach Boys’ gold records and paid to have Sadie’s teeth fixed. However, in August 1968, three weeks before his lease was to expire, Dennis moved in with Gregg [Jakobson], leaving to his manager the task of evicting Charlie and the girls. Bugliosi, Vincent; Curt Gentry. Helter Skelter: The True Story of the Manson Murders. W. W. Norton & Company. Kindle Edition. I have even heard it explained that Wilson left his Sunset Boulevard residence because he was afraid of Manson. After they split company by the official accounts Wilson had very little contact with the Family except for three occasions when Bugliosi says either Wilson or Jakobson told him Wilson had been threatened. But that may not be completely accurate….. In the December 21, 1968 British publication The Record Mirror a story appeared about Dennis Wilson. 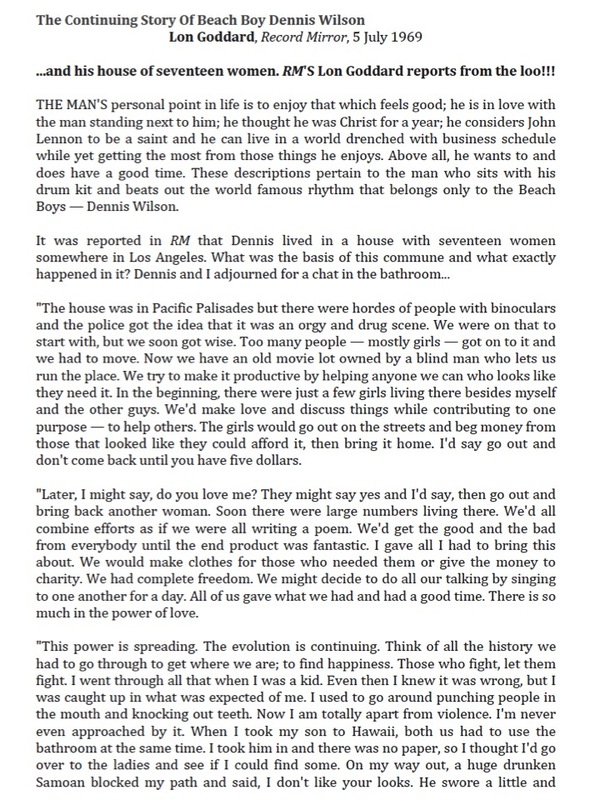 It briefly mentions Manson and the Family, “Dennis Wilson: I Live With 17 Girls” by David Griffiths. It can be found, here. One interesting aspect of the article is the quote attributed to Wilson that seems to suggest that he was having an ongoing relationship with Manson in December, 1968. The Death Valley reference is at least interesting as that is far from Sunset Boulevard. 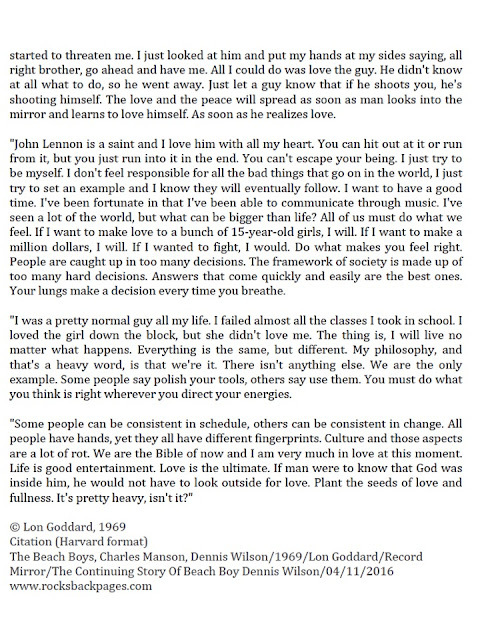 Given the ‘present tense’ language used by Wilson (that he ‘is’ living with 17 girls) and given the official timeline the only time the interview logically should have taken place was sometime between say late May and early August 1968, the timeframe when Wilson was officially connected to the Family. Then the explanation for the use of present tense might be simply that the interview wasn’t published until December. The problem is that during that timeframe Wilson was not in England. While the Beach Boys toured during the period they never left the United States. ‘Never Learn Not to Love’ was not recorded until September 11-18, again, after Wilson allegedly broke with Manson. From the same source (ESQ) Wilson et al were in England (and on the Continent) in December 1968. They were specifically in London on December 1st, 8th and 18th and were in England from December 1st to the 8th returning on the 18th. It appears, then, that at least the logical conclusion is that Wilson gave the interview during one of the December dates when he was in London in December 1968. But then why use the present tense language if he split with Manson in August ’68? It is arguable that the reference is misquoted. Wilson may have been talking of ‘back then’ and the author may have simply turned them to the present tense to sell the story, especially since the band was touring England. But why did that happen three times? The December ’68 story is not the only time after August '68 when Wilson proclaims his present tense friendship with Manson or that he is living with the Family. Starting with ESQ (http://esquarterly.com/bellagio/gigs69.html) where was Wilson in the Spring and Summer of '69? The Beach Boys started their 5th European Tour on May 30, 1969. They toured with Paul Revere and the Raiders and Joe Hicks from May 30th until June 22nd. They were in London on May 31st and June 22nd. They were at other locations in England and Scotland June 6-9th. In May 1969 this article appeared in Rave magazine, a London based pop magazine. 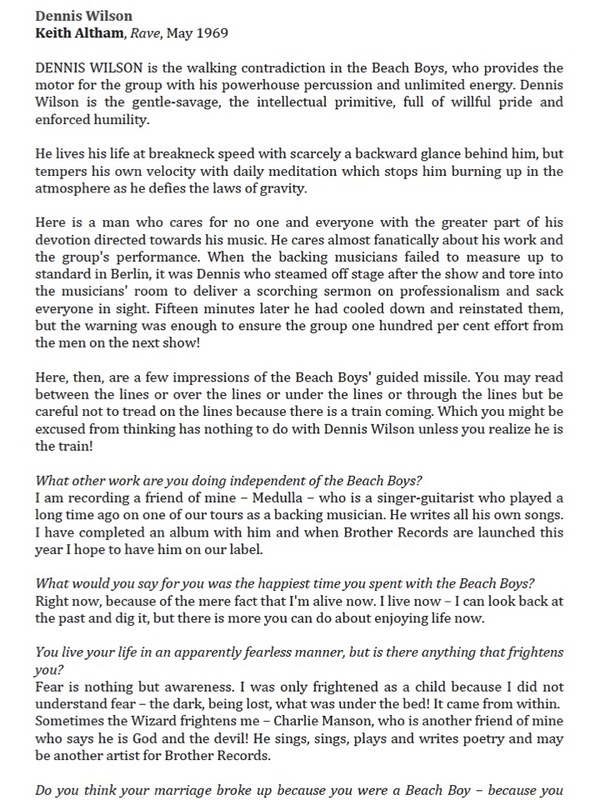 The Beach Boys concert in Berlin, mentioned in the article occurred on May 14th which means this interview could have occurred when the Beach Boys were in London on either May 31st or June 22nd. But that isn’t all. Lon Goddard for the Record Mirror (again) caught up with Wilson for an article that appeared July 5, 1969. Wilson in both articals from 1969 refers to his ongoing relationship with Manson and the Family and even suggests he is living with the Family at Spahn Ranch During May-June ‘69. The question is ‘why’? 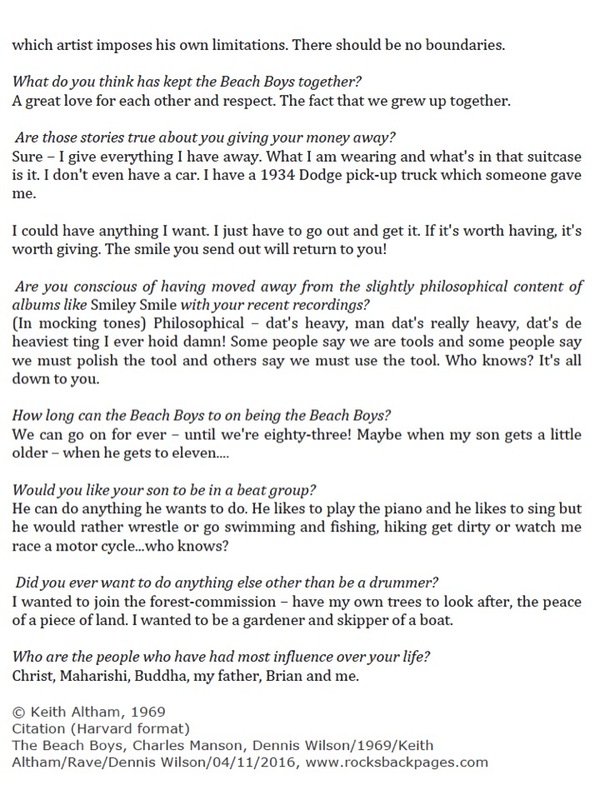 I think one answer is that Wilson was still interacting with Manson in May-June 1969. 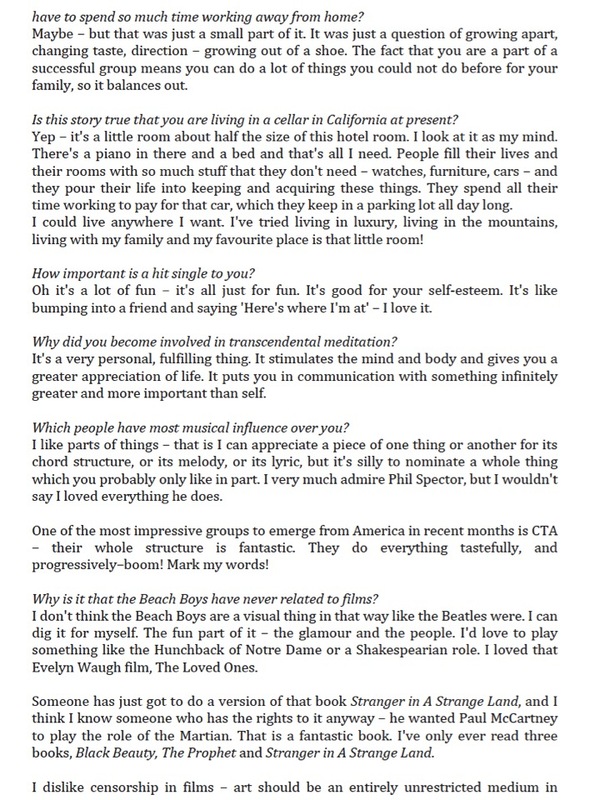 From ESQ you can see that he didn’t have a lot of time between August ’68 and July ’69 to be in Los Angeles but that could have allowed him to live a day here and there in a room at Jakobson’s and at Spahn. If that is the case then where did the official story come from? I think it might have to do with some old-fashioned PR 'damage control'. While their career was ‘fading’ in 1969 the Beach Boys were still one of the top bands (mostly on reputation). They also had, even with the drugs, more of a ‘good boy’ persona. Having Dennis hanging around Spahn Ranch a month before the murders, it seems to me, would not have been very good PR. Remember, after the murders in late August or early September Manson went looking for Wilson to get money (the bullet visit) which may suggest at least Manson still thought there was a relationship there. Since he did ‘abandon his home’ in August ’68 it would be easy to say ‘at that point I split from them’. It also provides an excuse to not testify. If Wilson was close to Manson in May-June ’69 I think Bugliosi would have been even more eager to interview him. Backing his exit up to August ’68 and refusing to testify drops Wilson down Bugliosi’s witness list to ‘unnecessary’. He had Jakobson and Melcher to fill all that in. Dennis is off the hook and the band is out of the headlines. 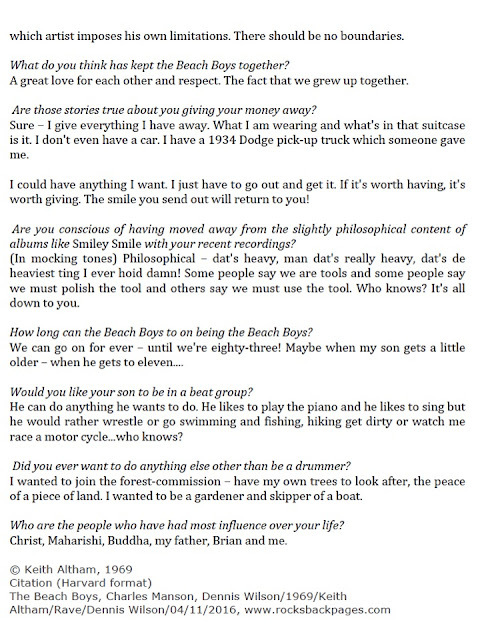 That also made me wonder what might have scared Wilson away shortly after the May- June '69 interviews. And that led me to the Mike Love story. Wilson allegedly told Love: "I just saw Charlie take his M16 and blow this black cat [man] in half and stuff him down the well." We know this never happened. But we also know that on August 1, 1969 Manson confronted and shot Bernard Crowe, a “black cat”. We also know Manson thought Crowe was dead. Could the Love statement be Dennis embelishing a story he heard while at Spahn? 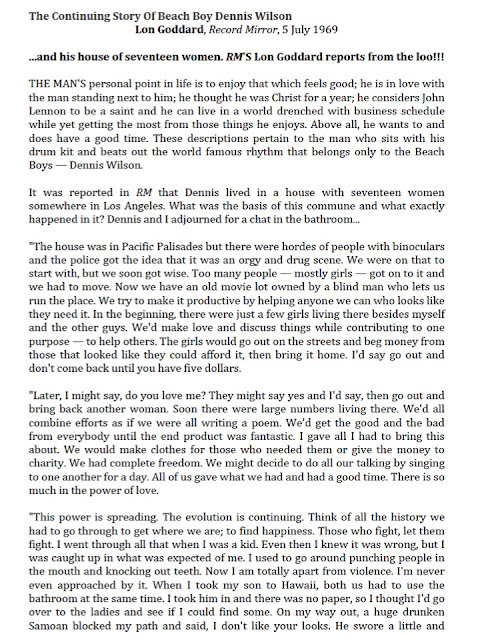 Or perhaps it was Mike Love embellishing a story Dennis embellished that also got garbled after 45 years. 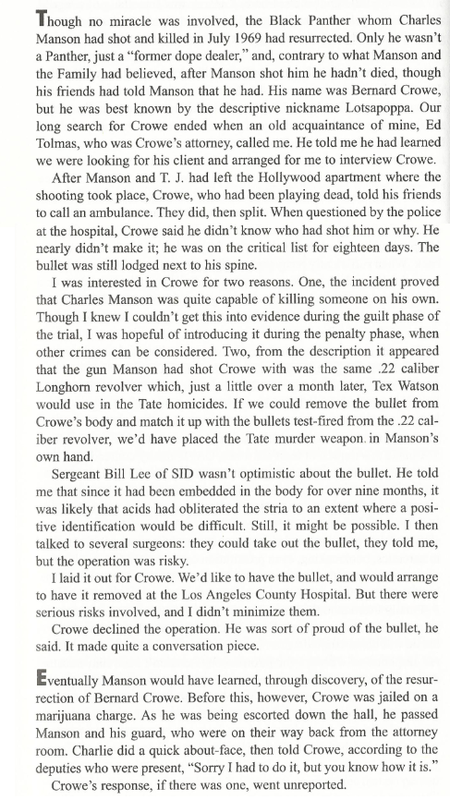 Wouldn’t the delivery of a bullet to Jakobson for Wilson be a far more effective as a threat if Wilson knew that Manson had shot a ‘black cat’? The timing, at least, is interesting. “On May 22, 1969, Manson telephoned his parole officer, Samuel Barrett, requesting permission to travel to Texas with the Beach Boys. Permission was withheld pending verification of Manson’s employment with the group. In a letter dated May 27, the same day as Scott’s murder, Manson said that the group had left without him and that he had moved from Death Valley back to Spahn Ranch. To categorize Barrett’s control over Manson as minimal would be an exaggeration. Barrett did not again talk to Manson until June 18. Bugliosi, Vincent; Curt Gentry. 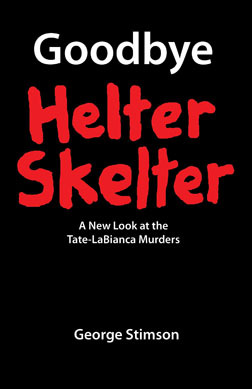 Helter Skelter: The True Story of the Manson Murders (pp. 568-569). W. W. Norton & Company. Kindle Edition. However, a check of esquarterly.com reveals there was no tour of Texas in May 1969. 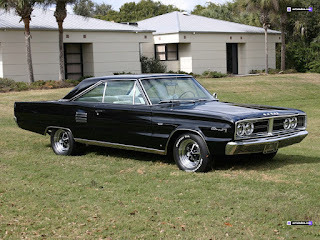 There was a tour of Oklahoma and a couple appearances in nearby states earlier in May 1969 but these predate May 22nd. In fact the first tour date after May 22nd is the European tour. This contact with Barrett is one of the small curiosities of this case. Barrett likely was referring to his file so his information would have been from that file. He might have noted the wrong location for the tour (Texas instead of Europe) but that seems like a strange mistake. It could also mean Manson lied to Barrett claiming to have such a ‘gig’ and then dropped the request when Barrett asked for verification. Manson may have thought he could pull a fast one: get permission for Texas and just go to England. 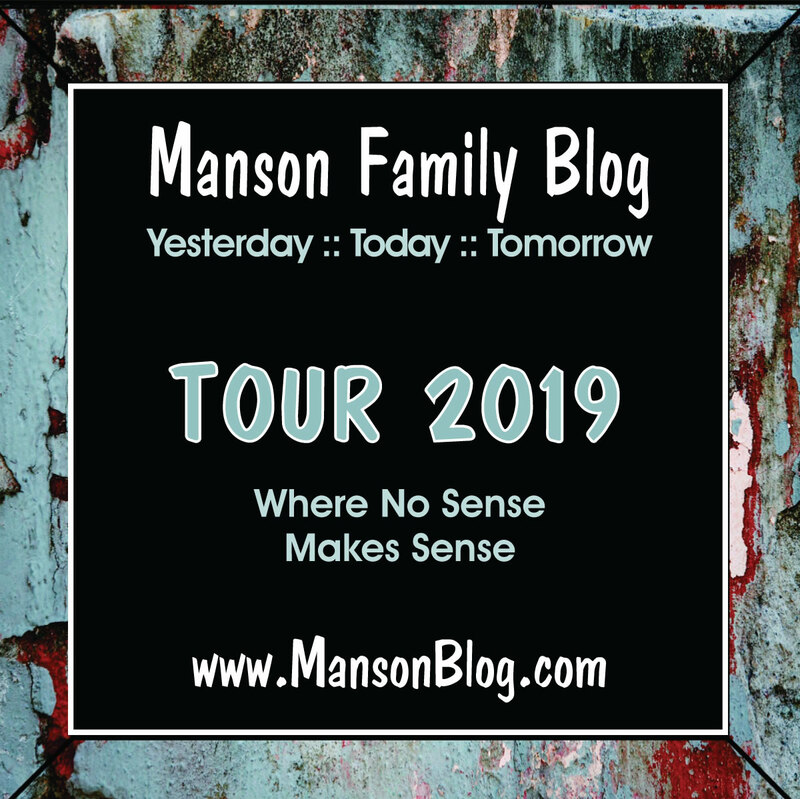 But Manson would need a passport and while a convicted felon can get a passport there is no evidence I have found that he had one and getting one on a few days’ notice is impossible. On the other hand he may have made up the story to get permission to go to Texas but why would Manson want to go to Texas in May, 1969. 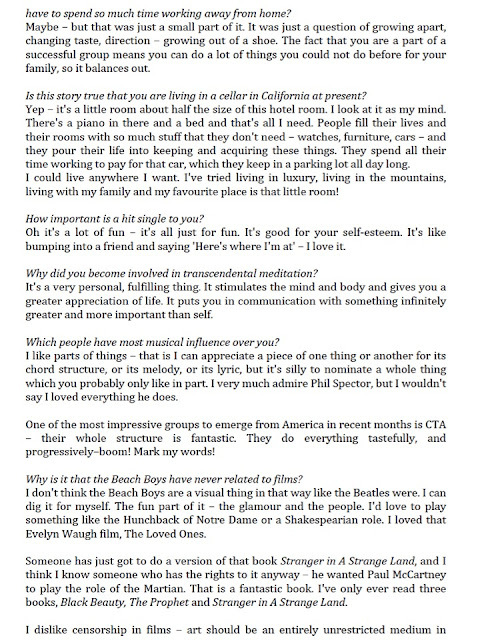 Regardless, it does appear to me that Dennis Wilson didn’t sever his connection to Manson and the Family until early July 1969 (or perhaps even later since the 'bullet visit is late August or early September '69). In October I was in Austin, Texas on business. As long as I was there I decided to make a side trip to Copeville to check out the Watson homestead. From Dallas you can make it in about a half hour or so. I did so with a heavy heart as it was the day after learning of our own Robert Hendrickson's death. I was surprised to see that the house is occupied. There were children's toys lying around and kittens pouncing about. It's much smaller than I had anticipated. Really small for the family of five that were the Watsons. 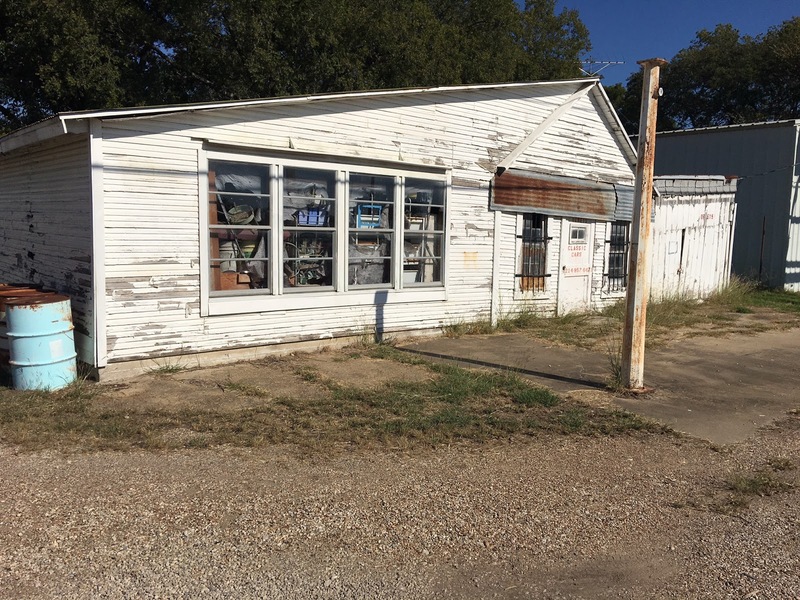 The building that served as Denton Watson's gas station/grocery store is locked up. The pumps are gone and grass grows through the cracked & broken concrete. There is a security fence surrounding the rear portion of the former store and the metal building adjacent to it. Inside the fence was a large dog. We could hear music coming from within the metal building, but no one responded to our knocks. It was a tad spooky. 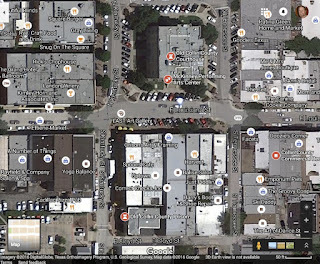 Tom says that the street was once a happening place with cafes, stores and other businesses. Copeville is surrounded still to this day by thousands of square miles of farm land. Farm vehicles roll slowly on the streets and everyone you pass gives that forefinger salutation from the steering wheel. Inspired by Matt's post above about his recent trip to Copeville, Texas I decided to visit some locales relevant to Charles "Tex" Watson's life in the area on my own during a Thanksgiving-time trip to Dallas. The first place I stopped was at the Thompson Cemetery in Lavon, Texas. This is the final resting place of Watson's parents, Clarence Denton and Mary Elizabeth Watson. I was really surprised by what I found there. Rose bushes have been planted by the graves in such a way as to almost totally obscure the two headstones on them. No other graves in the 800-plus graves cemetery had such a landscaping feature, and I've never seen such an arrangement at any other grave in any other cemetery. I can only speculate on what the presence of the bushes means, but it's almost like the parents didn't want to be found and recognized in death. The names of the families buried in the cemetery have been rendered in the metal fencing surrounding it. Charles Watson's parents are the only two Watsons buried there, although there are numerous Montgomeries (Mary Watson's family). The parents' grave site is visible left of center. almost totally blocking the names on the headstones. and reading them upside down. Will You Die For Me? His father looks very pained. The next place I went was to the Copeville Community Methodist Church, the site of Watson's early religious training. As we poked around the property, took pictures, and tried the locked front door, a Collin County sheriff's deputy pulled up and parked in an adjacent parking lot. But just as I was going over to him to introduce myself he drove away. 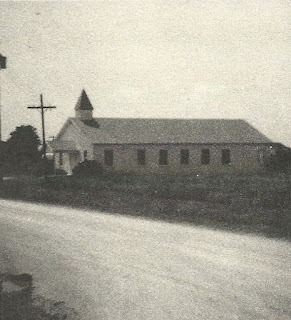 Above, the Copeville Community Methodist Church as pictured in Will You Die For Me? The church is within easy view and walking distance of the former Watson residence and gas station. "By late the next day [after Watson's arrest], the story had hit the wire services, reporters had started calling my parents at home, and photographers and newspeople were descending on McKinney in droves. My parents had to fight their way through a large crowd to get into the jail. "It was front-page news. Los Angeles Police Chief Edward Davis gave a press conference to announce that warrants had been issued for the arrest of Patricia Krenwinkel, Linda Kasabian, and Charles Watson (Charlie, Susan and Leslie would be named later) for the murders of Sharon Tate, Jay Sebring, Abigail Folger, Voytek Frykowski, Steven Parent, Rosemary LaBianca and Leno LaBianca. He told the two hundred reporters from around the world that the crime of the decade had been solved. "A few days later my father painted over the WATSON on the front of the store he'd taken half a lifetime to build." -- Charles Watson in Will You Die For Me? The Watson house in Will You Die For Me? The Watson house today. The front door was ajar, but I didn't knock. 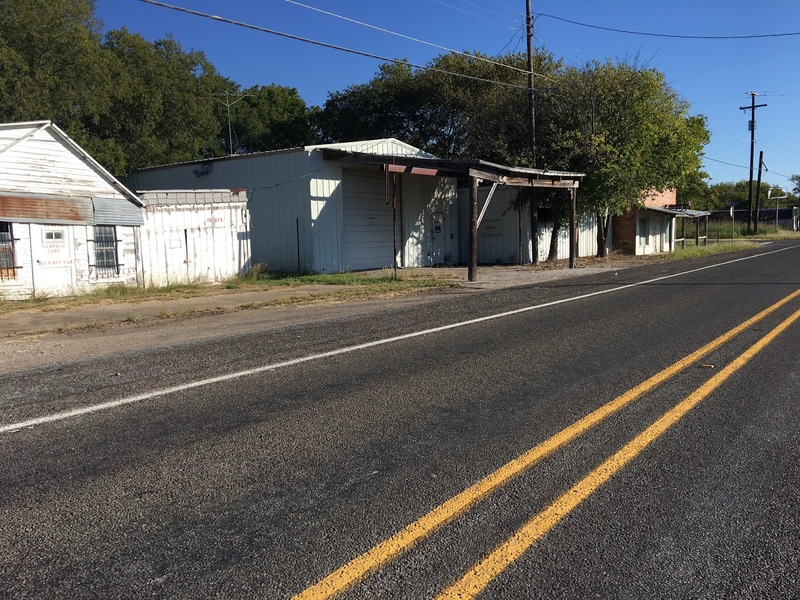 Watson attended high school in Farmersville, just under eight miles to the north. 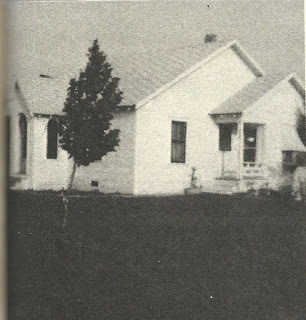 Farmersville High is where Watson's infamous theft of four typewriters occurred during a fraternity initiation when he attended the North Texas State University in Denton, Texas, another 20 miles to the west. I knew that the old high school had been completely torn down, so I made no effort to locate or photograph the new school. 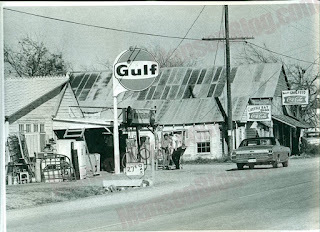 But I did want to see what the town and surrounding countryside looked like, so we went through there on the way to McKinney. On the way we passed Lavon Lake. Watson took a girl there for an afternoon of recreation on the day that he was arrested for the Tate/LaBianca murders. 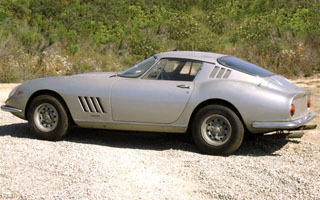 "On November 30, I took a drive with my rediscovered girl friend. We had a quiet day at a nearby lake, sitting on a blanket, talking. For some reason, I felt I could relax around her, and we even wove fantasy plans of running away to Northern California together. She was very bored with Texas, and California had the same allure for her it had once held - it seemed like an eternity ago - for me. It almost seemed possible that there might be a future. 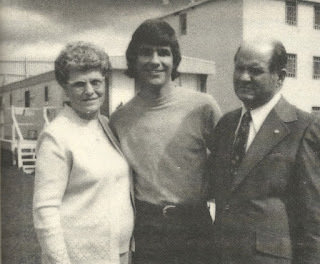 "When I got home that afternoon, my father and my mother's brother, Maurice Montgomery, were waiting for me. As soon as I walked into the dim, musty light of the store and saw the two of them together, my father's weathered face staring at me in pain and disbelief, I knew what had happened. The running was over." -- Charles Watson in Will You Die For Me? changed much from when Watson attended high school in the town. World War Two hero and B movie star Audie Murphy. After Watson's arrest he was taken to the county seat of Collin County, McKinney, where he was housed in the old county prison. "When we got to the sheriff's office in the big stone jail, just off the main square where the Collin County Courthouse punctuates the low-slung town, my second cousin, County Sheriff Tom Montgomery, called California again for more information but was told nothing except that I was to be held until Los Angeles detectives got to McKinney and that I was dangerous. As he led me to a cell with an embarrassed, apologetic grin, my cousin Tom said, “I think we'll be able to clear all this up quick enough. We know for sure you didn't commit no murder.” I walked into the cell without answering him." -- Charles Watson in Will You Die For Me? but the rear entrance to the structure betrays its former function. Watson successfully fought extradition to California for nine months. 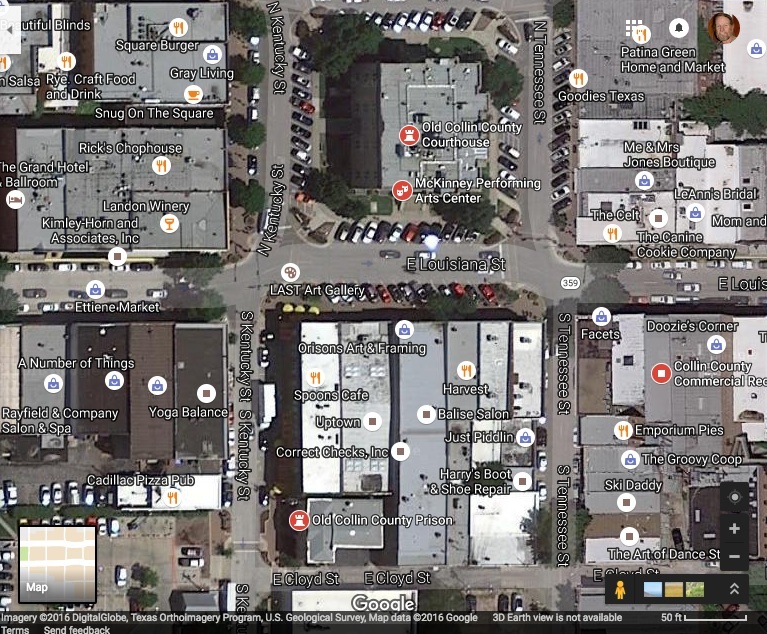 He attended his legal proceeding in McKinney at the courthouse in the center of the old town square. The old Collin County Courthouse. It now houses the local Center for Performing Arts. Although artwork now decorates the interior, the building still has very much of a courthouse feel. The courtroom/theater today, complete with segregation-era balcony al la To Kill A Mockingbird. A theater troupe was having a rehearsal while we were there. Charles Watson also spent several years in Denton, Texas, attending the North Texas State University. While there he tooled around in a 1966 Dodge Coronet 600 until he totaled it while running a yellow light during one of his nightlife forays into Dallas. Watson had hoped to pledge the Epsilon Delta chapter of the Pi Kappa Alpha fraternity at NTSU when he stole the typewriters from Farmersville High. Fate intervened however (he got caught) and he never made it into the frat. Today PKA still has a chapter at the former North Texas State University (now called the University of North Texas). The fraternity's website declares that "Pi Kappa Alpha’s members at the University of North Texas strive to be Scholars, Leaders, Athletes, and Gentlemen, and they seek excellence in everything they do." "Tex" Watson certainly excelled at what he did. 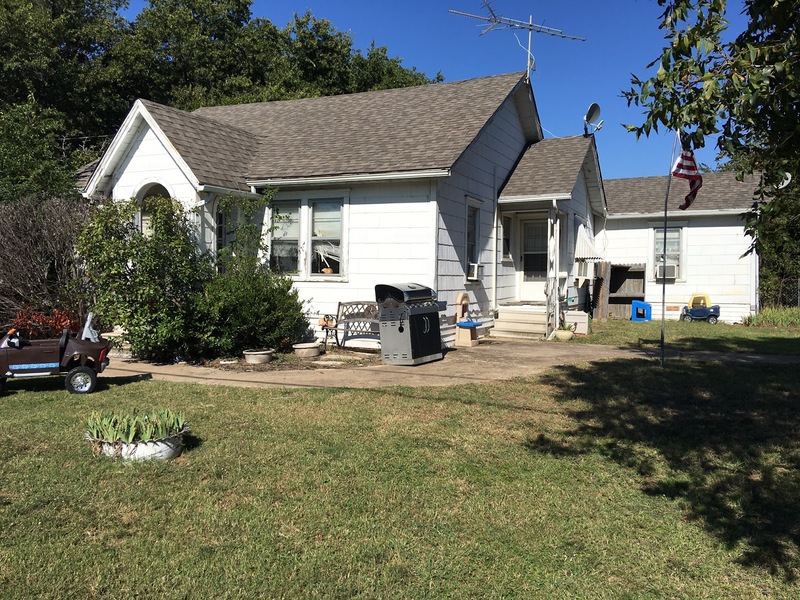 I was not able to determine whether PKA currently had a frat house, so we didn't drive the additional 30-some miles from McKinney to Denton to check it out.